Ray Stantz: I tried to think of the most harmless thing. Something I loved from my childhood. Something that could never ever possibly destroy us. 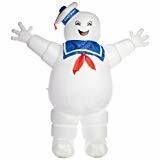 Mr. Stay Puft! Peter Venkman: Nice thinkin', Ray. 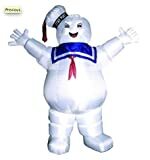 Although a lifesize inflatable 100 foot marshmallow man would be ideal for terrorizing your neighborhood, this smaller, yet equally monstrous 8.5' Inflatable Ghostbusters Stay Puft Marshmallow Man is still just as menacing on your front lawn. 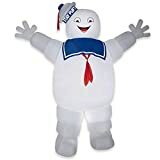 This inflatable chosen Destructor / homicidal marshmallow sailor mascot is definitely something you don't see everyday, but you don't need to cross the streams to take him down, just pull the plug. Makes a great decoration around Halloween or just anytime you want to annoy the neighbors.